Happy Thanksgiving! I hope you will be enjoying this bountiful holiday in the company of family and good friends. I wanted to share some special thanks to you all from the girls at Roya’s School in Kabul and Mazar e Sharif. ZAANHA Fund started Roya’s School almost 4 years ago with 6 girls. To date, 31 girls have either graduated or are current students. 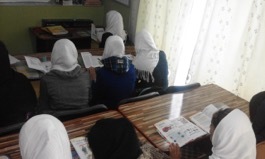 The girls, unable to travel alone to central Kabul and Mazar to attend classes, learn English and computer skills in Roya’s hom e. Two of the original 6 girls were admitted to Kabul University last year because they had these skills! I received a letter from last week from Roya and wanted to share it with you. Roya just got married and lives in Mazar e Sharif where she’s starting the second branch of Roya’s School. The original class outside of Kabul is being taught by one of the original students in her home. A special thank you to you all from your friends at ZAANHA. Salaam Alikm Dear Miss Wendy! I hope you and your great family is doing well, I and my great in-laws all are fine here and everyone say salaam to you. Five days ago since 31 October we started our new collection of girls in Mazar e sharif, totally they are ten girls, all of them are students from 7th to 12th class. I am going to attach their list and purchased bills of class materials. I will send you their attendance sheet monthly. I wish to thank you for the support and help you provided, for your dedication, attention and open-minded thinking and for your readiness to help with very prompt response. When I told my suggestion to Nasima jan that I want to open another branch of this school in Mazar e Sharif, she smiled and took my hand with her warm hands, she volunteered to help me, and when I turned to you for assistance, you immediately agreed and did your utmost to provide it as quickly as possible. All this was done in order to make things easier for me, Thank you for opening this door of opportunity, which is a huge step for Afghan girls. Thank you so much Miss Nasima jan, and once again thank you dear and sweet Miss Wendy for giving me strength and succeed. With warm hug and kisses to both of you.